Payvandy, P. (2015). Investigating Nonlinear Kelvin Model Accuracy Optimized by Genetic Algorithm for Determining Drying Behavior of Knitted Fabric. Journal of Textiles and Polymers, 4(1), 1-8. Pedram Payvandy. "Investigating Nonlinear Kelvin Model Accuracy Optimized by Genetic Algorithm for Determining Drying Behavior of Knitted Fabric". Journal of Textiles and Polymers, 4, 1, 2015, 1-8. Payvandy, P. (2015). 'Investigating Nonlinear Kelvin Model Accuracy Optimized by Genetic Algorithm for Determining Drying Behavior of Knitted Fabric', Journal of Textiles and Polymers, 4(1), pp. 1-8. Payvandy, P. Investigating Nonlinear Kelvin Model Accuracy Optimized by Genetic Algorithm for Determining Drying Behavior of Knitted Fabric. 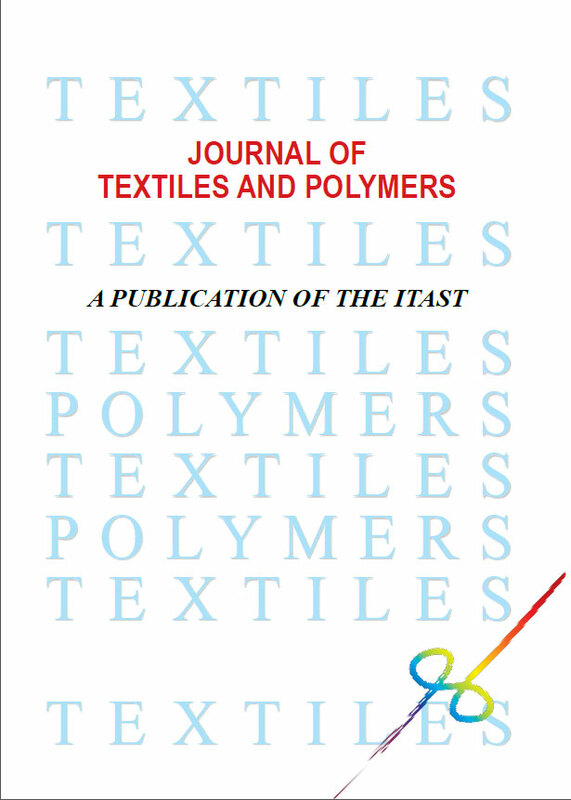 Journal of Textiles and Polymers, 2015; 4(1): 1-8. Knitted fabrics are widely used by the underwear apparel industry due to their good elasticity. Modeling the mechanical behavior of knitted fabrics using Kelvin model is one of the discussed subjects in the textile industry. The purpose of this study is to investigate the accuracy of a nonlinear Kelvin model for determining the drying behavior of knitted fabrics. To fulfill this aim, genetic algorithm was used to optimize the model to achieve the lowest error between experimental and model results. The Kelvin model consists of a concentrated mass, a spring and a damper which are arranged in parallel. In the model a timevarying mass was considered due to the fabric drying process. Also, the behavior of the spring and damper were considered to be two-order nonlinear. Because of the nonlinear behavior of the spring and damper, the determination of the spring and damper coefficients by numerical methods was complicated. These coefficients were determined by minimizing the errors between the model and experimental results using the genetic algorithm. The results of the modeling of the knitted fabrics were compared to the experimental data for five samples with different course densities. The meaningful 4.5 percent difference between the purposed model and the experimental values proved that the presented system had acceptable results which could be used to investigate the length changes of knitted fabrics during drying processes. So, it was confirmed that the drying behavior of the knitted fabrics can be simulated by the nonlinear Kelvin model. knitted fabric spirality using genetic programming”, Text. R. J., vol. 82, no. 7, pp. 667-676, 2012.
knitting technology”, J. Text. Inst., vol. 96, no. 3, pp. 175-178, 2004.
algorithm on production scheduling of elastic knitted fabric”, J. Eng. Applied. Sci., vol. 1, no. 2, pp. 149-153, 2006.
for woven fabrics”, Text. Res. J., vol. 73, no. 2, pp. 105-112, 2003.
time in dryer on cotton fabrics”, J. Text. Inst., vol. 94, no. 1, pp. laundering to shrinkage of weft knitted fabrics”, Text. Res. J., vol. 73, no. 3, pp. 187-191, 2003.
analysis of the felting shrinkage of plain knitted Wool fabrics”, Text. Res. J.,vol. 74, no. 5, pp. 399-404, 2004.
dimensional stability of cotton knitted fabric”, J. Text. Inst., vol. 100, no. 6, pp. 530-538, 2009.
vol. 58, no. 8, pp. 329-351, 1967.
damper model and straight forward expansion”, Modares. Mech. Eng., vol. 14, no. 1, pp. 1-8, 2014 (in Persian). fibers”, Text. Res. J., vol. 48, no. 7, pp. 429-431, 1978.
viscoplastoelastic behavior of tencel fiber”, J. Northwest. Inst. Text. Sci., vol. 13, no. 4, pp. 399–402, 1999.
no. 8, pp. 461–470, 1995. Polymer, vol. 45, no. 5, pp. 1717-1728, 2004.
algorithm in practice”, Inform. Comput. Sci., vol. 167, no. 1, pp. Statistical Software, vol. 53, no. 4,pp. 1-37, 2013. BS 5441, Methods of test for knitted fabrics, (1988). Garments after Home Laundering, (1997).